I am really all in on this new thing where Netflix rolls out multiple specials at once for U.K. comedians who haven’t gotten much play stateside yet. I’ve written about how taken aback I was by the collection of James Acaster specials Netflix dropped earlier in the year, and now I’m regularly lulled into relaxation by the comforting comic rhythms of those specials whenever I can’t sleep. 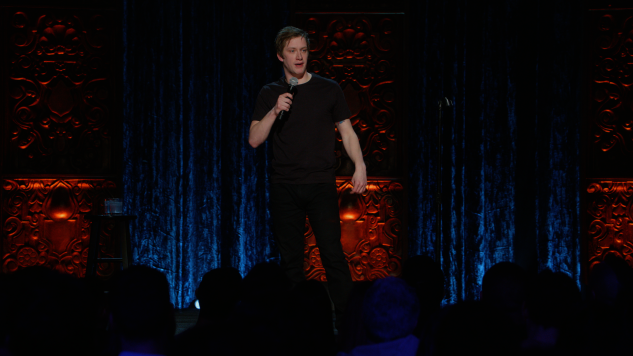 Now, Netflix has released a collection of two specials by the Scottish comedian Daniel Sloss called Live Shows, the first of which, Dark, marks his first truly significant splash in the American market. Sloss has talked about opening for Dave Chappelle, and how he wants to shock the crowd in order to force them to think. The irony is that his approach is very different from Chappelle’s. First and foremost, he wants to disarm you by playing the fool, and even when unpacking your own stupidity for you, he deliberately undercuts his authority, and it never feels self-righteous. Sloss never punches down, which I’d never complain about—the only reason that sometimes turns on him is that his opinions are so defensible that the fervor with which he tries to sell you on them can occasionally feel unnecessary. Sloss’s presence is extremely amiable—it doesn’t take much for him to sell us on anything. The microhesitations and verbal hiccups come from a long and noble line of U.K. stand-ups, and while they can sometimes feel at odds with how technically precise he is as a performer, you can at least be sure he’s in control, and, in a way, taking care of you. With Dark he lets you have your night.